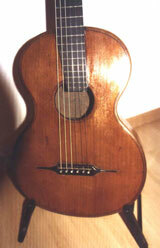 This is an early 19th-Century Viennese guitar (probably ca. 1810). It is definitely of the Staufer school in Vienna (Johann Georg Stauffer is the builder who taught C.F. Martin before Martin moved to the US). The braces, instrument shape, design and exceptional workmanship indicate this, but without any other identifying marks, it's impossible to know the builder. She was fully restored in 2002 by Urs Langenbacher (Füssen, Germany). Urs is one of the most respected builders and repairmen in Europe and is the only guitar builder to ever win BOTH Gold and Silver Medals at the International Builder's Competition in Baveno, Italy. Needless to say, his work is flawless. -As is the tradition among the best restorations, Langenbacher did not attempt to sand out any dings or scratches (beyond general cleaning). Doing so would change the thickness of the wood and probably alter the sound. I originally purchased this guitar in Vienna from a private collection. Langenbacher repaired several cracks (none were structurally dangerous), set an entirely new fingerboard/frets (in ebony), rebored and reset new pegs, a new end pin new string pegs and did an overall cleaning and refinishing & polishing. He also reset the neck (which was already perfectly straight) at the heel and closed the wood at the upper bout around the heel to stabilize any "floating" that sometimes occurs in guitars from this period. The sound on this guitar is very "Viennese" and would be an exceptional instrument for a performer who is venturing into 19th-Century performance or private collector. She also has a "floating fingerboard" (i.e. the fingerboard is raised above the body to allow for greater resonance of the table. This makes her, not only more playable above the 12th position, but increases the volume since the table can vibrate more freely. As a result, she has a projection that is better than 90% of the guitars I have played from this period and she could easily be used in concert or on recordings. Sadly, without proof of the builder, the price is thousands of dollars below normal for an instrument of this quality. However, for that very reason, this guitar is an exceptional buy. She plays flawlessly, has incredible timbre and sound projection and is, aesthetically, nothing short of beautiful. She comes with a modern hardshell case. Frets: 21 frets at the high e. Thus, she goes up to a c#, 2 frets higher than most modern guitars. This extension of the fingerboard is necessary to play many compositions from the 19th-Century by, among others, Legnani and Paganini.